Some people are funny. These guys are funny. The big claims guys. This is what you get when you combine one guy that is a business man, and one guy that is a chauffeur and thinks he knows a thing or two about cars. . Here is a perfect example. These guys call this a "production car". 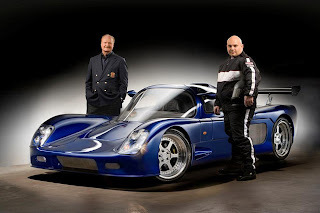 They took one Ultima GTR kit car, and put a twin turbo v-8 in it, with a 3 speed transmission. The car is quick. It should be quick. Its a twin turbo charged V-8, in a light chassis, with a ton of rear tire. However, it is in no way shape or form a production car. Offering a car, based on another car, is not a production car. Guys like this are a joke to me. If you put together a fast car, you put together a fast car. Don't call it a production car. Call it what it is, a kit car. The videos of failure after the jump.